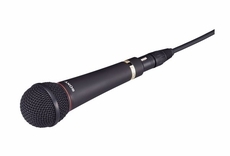 A perfect choice for critical live vocals or where high-quality, rugged reliability, and resistance to feedback are required. Sony Pro Audio's F-780/9X Hyper-Cardioid Handheld, Dynamic Vocal Microphone is an enhanced version of its top-of-the-line model F-780 dynamic vocal microphone. Improved sonic and mechanical characteristics make this mic a must have for professionals in the music and recording business. New, Improved capsule design : For enhanced audio performance; designed specifically for critical vocal reproduction live performance and recording. Rigid structure : Allows easy capsule movement for higher sensitivity and lower mechanical noise. Urethane coating : For extremely low handling noise. Tighter unidirectional polar pattern : For improved feedback rejection.